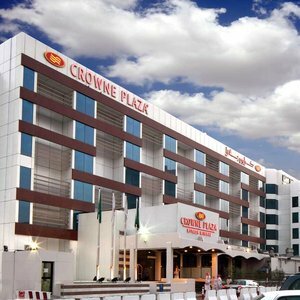 Revel in modern luxury and traditional hospitality at the sparkling Crowne Plaza Riyadh Minhal hotel. Breeze past the lustrous aluminium facade of Crowne Plaza Riyadh Minhal and into our cool Lobby, where we're waiting to greet you. Meet friends in Al Misharq cafe or check email with complimentary wireless Internet . When you're ready, head up to your room or Suite to refresh in the rainfall shower. Multinational companies, government offices and embassies are an easy drive from the complimentary car park at Crowne Plaza Riyadh Minhal. You can take our limo to Riyadh King Khalid International Airport in 30 minutes, or catch the complimentary shuttle to Riyadh International Convention and Exhibition Centre . Discover the city's history at the National Museum or watch it glitter from the summit of the Kingdom Tower. Al Yasmeen restaurant showcases global flavours and our catering service can host banquets for up to 2,000 guests at your office or home. Energise in the 24-hour Fitness Centre or unwind with Internet TV in your room. Our eco-friendly measures have set a gold standard for green hotels in the Middle East. Pick up Bedouin jewellery at a souk or browse modern malls, explore the Arabian Desert or tee off on nearby golfing greens. Whether this is your first stay at Crowne Plaza Riyadh Minhal or you're a regular guest, we'll leave you looking forward to your return.